These three beakers or flasks are of elongated, spherical form. Each sits on three small cabriole legs. Each is chased in high relief with Zoroastrian scenes and symbols. In a Persian style, they are likely to have been made by one of several silversmiths in Bombay who catered to the local Parsi community. The Indian origins of the three is attested to in part by the presence of Indian cows with humps on their necks (known as zebu or brahmin cattle) on two of the three beakers. By the early twentieth century, there were three main Parsee silver shops in Bombay that specialised in making Parsee-themed ritual items for the local community (Cama, 1998). muktad remembrance tables as offerings for the deceased. Muktad, the annual prayers for the dead, is celebrated in the last ten days of the Parsee calendar. The muktad days are set aside to remember the fravashis or spirits of the dead. A vase is commissioned for each deceased family member and during muktad, in a room set aside for the purpose, the vases filled with flowers, are placed on tables and blessed. Food and beakers of water are also left on the tables. A small fire is kept burning in the room for the ten days. Among the Parsee religious motifs on these beakers are the winged Parsee deity Ahura Mazda and representations of the sacred fire. Each beaker is decorated with an upper frieze of roses, which often appear on silverwork made for the Bombay Parsees. The three beakers here are in excellent condition. One has a more silvery tone than the others. This is probably because it was cleaned more than the others but in time, it will adopt the same hue as the other two. A Zoroastrian Tapestry: Art, Religion & Culture, Mapin Publishing, 2002.
to see other Parsee-related items. 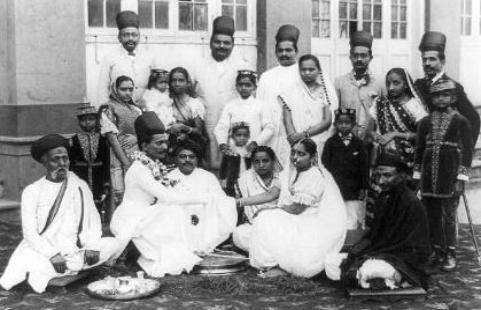 A Parsee family group, Bombay.